Pressure cookers have evolved a great deal over the three centuries of their existence. They were primarily designed to reduce cooking time by locking the pressure inside the container. The idea worked well and was very well received by the common people. Its use in homes and industrial kitchens kept on increasing and in a while, pressure cookers became a must-have cooking ware for most kitchens. On the one hand, where it helped users with convenient cooking, it brought about some major concerns on the other hand. One of them was safety. Since pressure cookers tend to lock pressure inside, they were vulnerable to implosion if not monitored properly. Back in those days, the safety precautions were not enough and pressure cookers continued to pose threats to human lives. Many people are reluctant to buy pressure cookers, due to the facts and figures that suggest pressure cookers are potential dangers. However, it has got nothing to do with the pressure cooker itself. The manufacturers are the ones to blame because inappropriate material and poor safety mechanisms can definitely lead to disaster. With major advancements and technological innovations, the modern pressure cookers have ensured safety and peace of mind. These pressure cookers are equipped with some of the best safety features that make pressure cooking completely safe and sound. Due to these amazing feature updates, the modern pressure cooker is nothing like those of the olden days. Most reputable pressure cooker brands offer the best products which are both reliable and durable. They pose no threat to human lives, thanks to the state of the art safety systems installed in them. These modern pressure cookers are referred to as the second generation pressure cookers. So, what’s new in this article? We will discuss with you some amazing safety mechanisms and precautionary gadgets that will ensure you a safe and enjoyable experience with your new pressure cooker. Before we move to discussing the safety features of modern pressure cookers, we should discuss the difference between the modern and the old pressure cookers. It will help you to understand why the modern pressure cookers are much safer and reliable as compared to the older ones. Pressure cooker production shot up after the end of World War II. Manufacturers who were previously making war equipment switched to making pressure cookers. This was the time when pressure cookers actually hit the markets with a bang. Production increased and stores made a great sale out of these pressure cookers. On top of that, people started selling their old pressure cookers in garage sales. Modern pressure cookers have taken the risk out of the equation. This mainly happened because of a large number of explosions that occurred with low-quality pressure cookers. Companies were bound to take steps for better engineering to come up with safer designs. The results were amazing and thanks to the latest technologies, pressure cooking is now completely safe. Since the competition is tough, companies are continuously updating their safety systems. These pressure cookers come with a reader’s guide and manuals which demonstrate how exactly to work with them. So, if you are thinking that an electric pressure cooker is far safer than the expensive stovetop modern pressure cookers, you may be wrong. 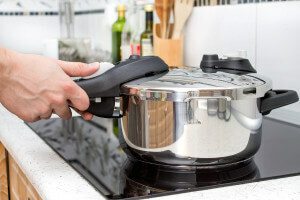 Factually speaking, stove top pressure cookers may be expensive but they have more than five safety features and mechanisms as compared to just two or three in electric pressure cookers. It is a good idea to read the manufacturer’s guide before purchasing a pressure cooker. The modern pressure cookers have been so well engineered that you need not worry about their handling and tendency to explode. These pressure cookers are more advanced and reliable than the old pressure cookers. So, now we shall see what’s so new in the modern pressure cookers that make them so durable and trusted. All modern pressure cookers feature a locking device on top of the lid. These locking devices only open once the pressure inside the cooker is reduced to an optimum level where it is safe to take the lid off the cooker. The lock responds to the pressure developed inside the cooker. Interlocking lids are super strong so that you can carry your pressure cooker by its handle without having to worry about the cooker opening up. Pressure release valves are pressure regulators that maintain the pressure inside the cooker to a controlled value. When there is sufficient pressure built up inside the cooker, these valves reduce the pressure inside by opening up. There are spring-loaded pressure relief valves as well as jiggle top valves. Their design techniques may be different but their primary objective is the same — to ensure pressure control inside the cooker. These valves are engineered in such a way that they are most suitable for operations above the boiling point of water. Reputable companies, such as Magefesa, Kuhn-Rikon, and Fagor manufacture spring loaded pressure valves. The designs are simple and effective. These valves ensure efficient pressure release without dropping the temperature inside the cooker. Spring loaded valves pop up and allow steam release once the pressure inside the cooker has increased considerably. This is an indication that the heat supply to the cooker may be reduced. Presto is a reputable company when it comes to the production of Jiggle-top pressure indicators. These pressure valves work well if the air inside the cooker is completely removed. They are different in design from that of spring-loaded valves. After evacuation, the weight can be placed on top of the lid. Jiggle-top valves tend to rock once the pressure reaches the optimum level. They also release excess steam during the process. 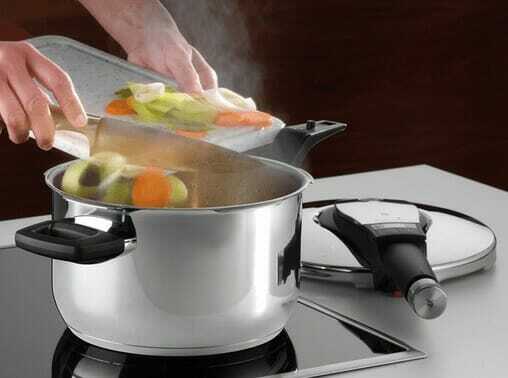 Pop-up indicators are another safety feature in modern pressure cookers. They indicate the pressure values inside the cooker with a lot of precision and accuracy. These indicators consist of a weight attached to the top of a stem. The stem may have markings and readings on it. Some indicators also have red rings around them. The indicator is kept with its stem inserted inside the cooker and the weight resting on top of the lid. When pressure builds up, the indicator starts to pop up and the readable value on the indicator tells the exact pressure inside the container. In case of red rings, the first red ring indicates lower pressure while the second red rings suggests that the pressure has reached the highest value. Besides the pressure valves, there is a gasket release aperture situated just under the lid. When the pressure reaches higher limits, the gasket is pushed upwards and the pressure is released through this aperture, ensuring temperature and pressure maintenance inside the cooker. When the minimum pressure limit for the valve is reached, the first indication comes in the form of a hissing sound. It is audible enough to be heard from outside the kitchen and tends to become louder as the pressure inside increases. The valve basement has escape holes. If the pressure increases further, the steam escapes from these escape holes to maintain the pressure inside. In case the escape holes are clogged due to steam, excessive pressure is then released through a safety hole in the rim of the lid. The final stage of pressure release occurs when the gasket is pushed upwards and the steam escapes through the aperture located under the rim of the lid. Handling a pressure cooker requires a lot of expertise, especially when the handles do not offer much assistance. Thanks to the modern pressure cookers, handling a completely stuffed pressure cooker is no longer a challenge. Different companies use different types of handles and materials. Normally hard rubber and suitable plastic that can bear high temperatures are used for handles. You should ideally look for longer handles on one side and shorter on the other side. There are several advantages of such a handle design. They are easy to carry even when they are full. Locking becomes much more convenient. Longer handles stay cool, which prevents your hands from burning. This is one feature that is normally not looked at as much as the other safety features in a pressure cooker. However, the base of your pressure cooker can determine how long it will last. People often complain about having developed a hotspot under their cooking utensils due to continuous heat exposure to one spot while cooking. Aluminum tends to heat up quickly so the food gets cooked rapidly. Aluminum tends to react with food but since it is sandwiched between stainless steel layers, there no longer is a problem. Three-layer design also allows the base to heat evenly. Therefore, there are no hotspots developed under your pressure cooker. Reactive metals, such as copper and aluminum can be damaging to your food. Also, they tend to heat up a little too quickly for food, so there are chances of burnt and scorched food. However, the problem is avoided, thanks to the innovative stainless steel technology. Stainless steel is so well-engineered that it is lightweight and super strong. Hence, it can hold heavy quantities of food inside the container. It is easily washable and dishwasher safe. Also, it does not heat up too much as did the copper and aluminum containers. Therefore, the food quality is preserved. Stainless steel also gives the pressure cooker a stylish and shiny look. Modern pressure cookers have made lives easier for most people around the world. They have replaced other cooking utensils thanks to their intelligent designs and efficient cooking. 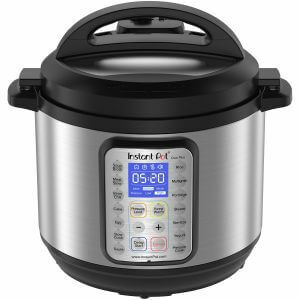 Modern pressure cookers offer convenience, durability, reliability, and safety to the users and therefore they have almost become a necessary kitchen item these days. Pressure cookers are getting advanced with time and some of the modern pressure cookers are electrically controllable and they can indicate the pressure and temperature digitally. They are completely closed systems which makes them completely environmentally friendly as well as they can add beauty to your kitchen shelf. They offer convenience in transportation, as well as their compact size makes it easier to store them. There are several companies and manufacturers around the world that produce high-quality pressure cookers which have the state of the art safety systems and mechanisms installed to ensure that users do not face any risk of burning or explosions while cooking. In fact, these pressure cookers have made cooking a lot more enjoyable and interesting. 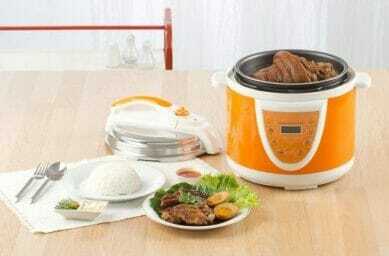 Even the amateur cooks and novices can now easily cook with pressure cookers. This is the level of safety they provide. So, now you know what to look for when you go out to buy your pressure cooker.